"Light fruity aroma... Rich blueberry muffin taste... Baked into every bite... A classic flavor the whole family can enjoy..."
This is the understatement of the summer. This new cereal is absolutely fantastic. The aroma isn't just light and fruity... it's blueberry-tacular. You don't just get a whiff of blueberry. If you have even a passing interest in blueberry flavor, I guarantee that your nose will get you excited about this cereal before your mouth has a chance to get in on the action. As for taste... the "muffin" aspect of the title is fairly meaningless. You won't take a bite and say you're reminded of a muffin. However, you will get an overwhelming taste of authentic blueberry goodness. As opposed to a muffin, I'd say this cereal tastes more like tiny blueberry pies with an inordinate amount of wheat and a sweet, sugary blueberry glaze. The blueberry favor isn't confined to the coating. You'll find small specks of blueberry embedded in each wheat biscuit. To top everything off, this cereal is even fun to look at. The purplish-blue and white coating is festive. I could imagine Kellogg's coming out with a limited-edition 4th of July blueberry and strawberry Mini-Wheat - a red white and blue American cereal masterpiece. It's been a good year for blueberry cereals. Earlier this year, I gave a perfect rating to Heart To Heart With Wild Blueberry Clusters from Kashi. Blueberry Muffin Mini-Wheats is just as good and a little more fun. Each 24 biscuit serving contains: 180 calories, 1 gram of total fat (0 grams saturated and 0 grams Trans), 5 grams of dietary fiber, 12 grams of sugar, 4 grams of protein, 90% of your recommended iron intake and a smattering (usually 25%) of other vitamins and minerals. 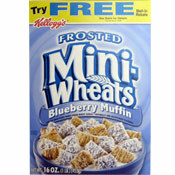 What do you think of Blueberry Muffin Frosted Mini-Wheats? I just read an article that said apparently there isn't real blueberries in them. Blueberry yum yum... great cereal! I tried these for the first time last week and I was pleasantly surprised. I thought they would taste awful with the frosted blueberry flavor sugar, but they actually taste pretty good. I have to get blueberries to eat with them because I think the addition of blueberries would really make them taste like blueberry muffins. Does not contain any blueberries, despite a picture of blueberries being shown on the box. I thought it was going to be gross, but I have to say I really enjoyed it. It really does taste like blueberries!! I used to be a Fruity Pebbles kind of guy until this came along and I have to say that it's amazing! My new favorite cereal. I stood in the cereal isle looking at all the different flavors of Mini-Wheats and decided to be brave and try these. I absolutely LOVE them. They are amazing. Too bad not everyone agrees... but you either love or hate them. I pick love :) I am definitely getting more. I'm a nurse and am always seeking out great little treats that are nutritious and tasty... this cereal fits the bill! Love it! OMG... I never expected anyone to remotely like this cereal. I LOVE mini wheats, and bought three boxes of blueberry as that was all they had. I could not imagine the experience of trying to eat it to be so bad. If I knew what windex tasted like, this would be it. The after taste is horrific and does not go away. I got sick forcing myself to eat a few mouthfuls as I figured I just have to get used to it. But gave up. It took several hours to get the taste to go away. I brushed, ate different food, lemons, peanut butter. etc. it stayed no matter what. I see a review from "Nicole" addressing the after taste. So I'm glad I am not the only one. But she got further than me. I will now donate the other 2 boxes. YUCK! "Cereal of the Decade" 00-10 Award Recipient! 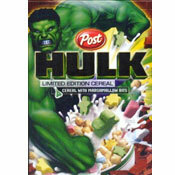 I told everyone about this cereal I have to have it before i go to bed. This is a cereal that was recommened to me from a friend and he loved it. So i like blueberries and muffins so i took his word and bought a box. It was very good a little lacking in the muffin part but there was a decent blueberry element. Has a strange "dry/powdery" aftertaste. I tried this and it had an awful after-taste. I couldn't stand it. The strawberry mini-wheats are to die for though!! No after-taste and yummmmy. I'm gonna have to try this. As soon as I saw the commercial on TV I knew it was gonna be good.